The 14th annual Marshall County Relay For Life fell just short of another fundraising record – at least for now – but raised $84,484.88 for cancer research to boost its 14-year total to a whopping $938,379. After battling 90-degree heat a year ago, this year’s event sported cool temps and rain. Because of the wet conditions the 1,278 luminaries were not able to be lighted, but the honorees were all recognized when the final hours of the event held from noon to midnight were inside in the Kidder Gym. Jones said that additional funds are also expected and that the fundraising total could still approach the record of $86,897 set a year ago. That total ranked first in the Midwest Division and second in the country among communities of 10,000 people or less and was the sixth straight year that a fundraising record was set. A total of 11 teams, 121 walkers, and 46 volunteer walkers participated in this year’s event. Andy Young, 81, was the oldest man, Althea Brown, 90, was the oldest woman, and Calin Olson, 3, the youngest walker. Margaret Thuringer of Eden was the longest living cancer survivor at 25 years. The Quarve Quackers were the top fundraising team with $13,385.50. Linda Flanery was the top individual woman fundraiser with $2,931.50, and Victor Vondercek of Minneapolis was the top man fundraiser with $1,000. Hailey Aldentaler brought in the most money for youth with $416. Brett Dinger walked the most miles for men with 20, while Jenni Deutsch logged the most miles among women with 16.25. Hannah Miller walked the most miles in the youth category with 10, and Addison Wade was the top volunteer walker with 10 miles. The Eden Muskrats totaled the most team miles with 223.5. The Eden Muskrats also received the Team Spirit Award. Quarve’s Quackers were judged as having the best decorated campsite with the Wacky Walkers second and the Lake City Leading Ladies third. In the cake contest (judged by the amount of money left in cans for each cake) the Wacky Walkers took top honors with the Eden Muskrats second. The highest selling cake in the auction was made by Caring Connections and sold for $120. Despite the event’s annual success at raising money to fight cancer, Jones and Symens both said it has become so much more than just a fundraiser. 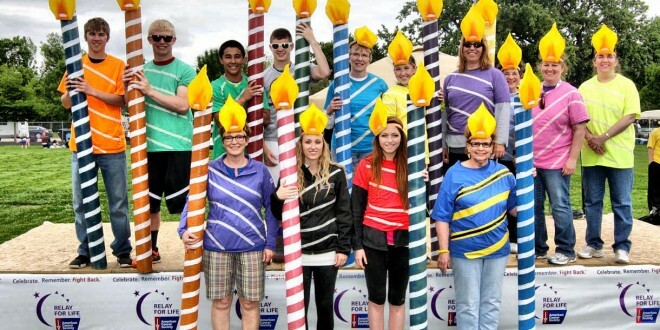 Work has already begun on next year’s Relay For Life scheduled for June 14, 2014.